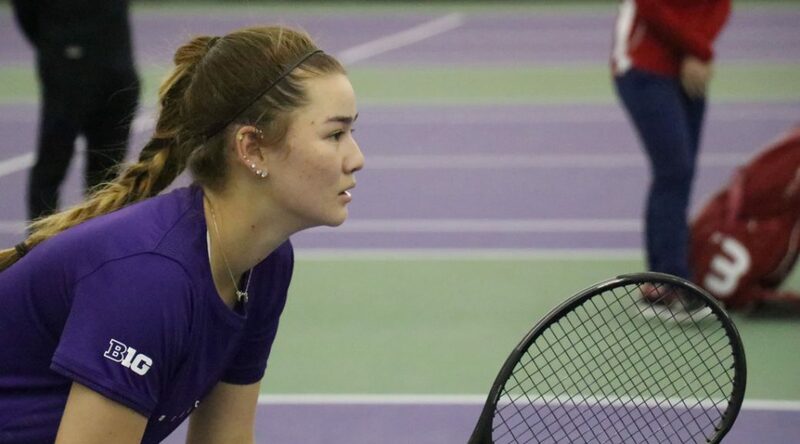 When freshman Clarissa Hand arrived in Evanston in the fall, she didn’t quite know where she’d fit into Northwestern University’s tennis lineup. Fast forward to the winter/spring dual-match season, and Hand is leading the Wildcats at the No. 1 singles and doubles positions. Pollard said Hand’s play against other top players during invitationals and tournaments during the fall season earned her the spot at the top of the lineup. Her results included advancing to the semifinals of the Intercollegiate Tennis Association (ITA) Midwest Regional and a win over the seventh-best player in the NCAA two weeks ago at the Miami Spring Invite. Hand said she’s ready for the challenge of playing in the No. 1 position. “I really want to do well at No. 1, but I know that every opponent that I’m going to play is going to be really tough,” she said. Before joining the Wildcats, Hand was a 5-star recruit from Moorestown, New Jersey. Some of the top women’s tennis programs in the country wanted her, including Notre Dame, Virginia, Wake Forest, Stanford, UCLA and North Carolina. Ultimately, she knew Northwestern was where she wanted to be. Coming to college and playing college tennis involved a number of significant life changes for Hand, both on the court and off. Hand said she was drawn to how Pollard handles Northwestern’s matches and practices – with tough love. “I think I respond better to tough love, and when I’m doing something wrong, just telling me straight up,” Hand said. Even though she’s a freshman, Pollard still expects Hand to be a leader for the Wildcats, especially as the team’s best player.